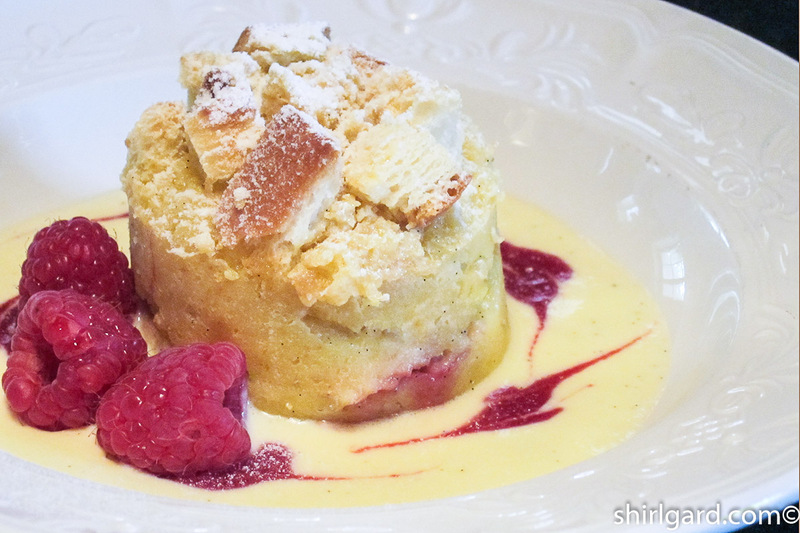 One of my favorite tasks when I was a restaurant pastry chef was writing menus; this dessert−Lemon Chiffon Roulade−is lifted right from the Mother’s Day Menu 2011 at The Old Inn On The Green (New Marlborough, MA). Each year, my Mother’s Day Menu would have three dessert choices: definitely something chocolate, probably something fruit-y or custard-y, and usually something lemon. 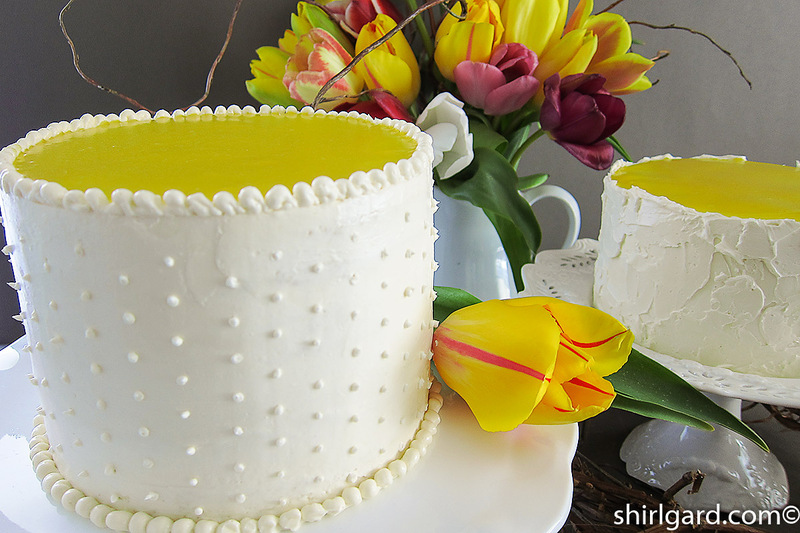 Somehow, lemon just seems right for Mother’s Day. 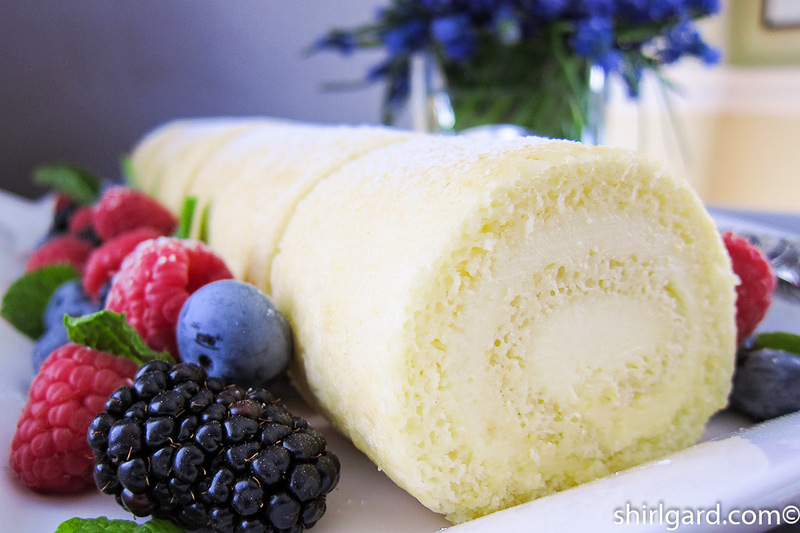 I can’t explain it, but it’s just right; I’ve done many lemon desserts for Mother’s Day over the years, from tarts to cakes to this lemon roll. 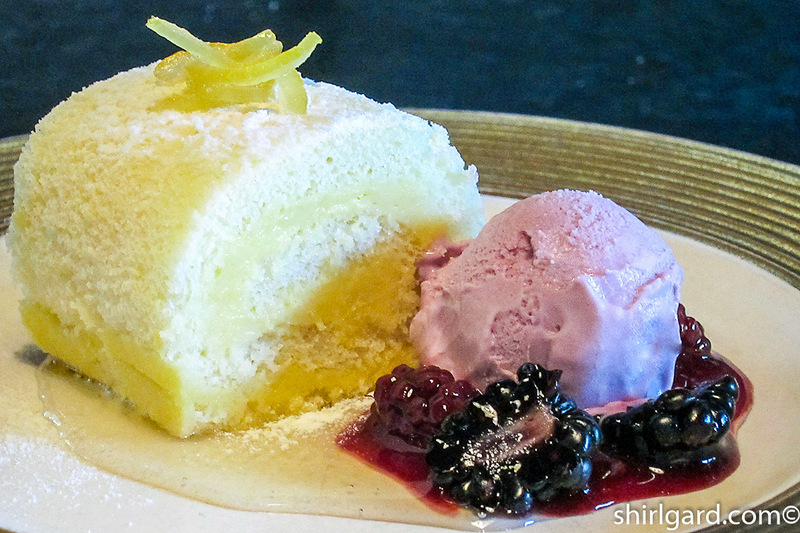 See my post from a couple of weeks ago−another lemon choice for mom on Mother’s Day−Lemon Chiffon Mousse Cake (4.20.16); it’s a delicious cake version of the components in this recipe, including Lemon Chiffon Sheet Cake and Lemon Mascarpone Mousse. I always liked the creative process of putting together a menu; I got inspiration from so many different sources: the internet, cookbooks, magazines, or eating at a nice restaurant. Or, just driving home from work, my mind would wander into dessert possibilities. 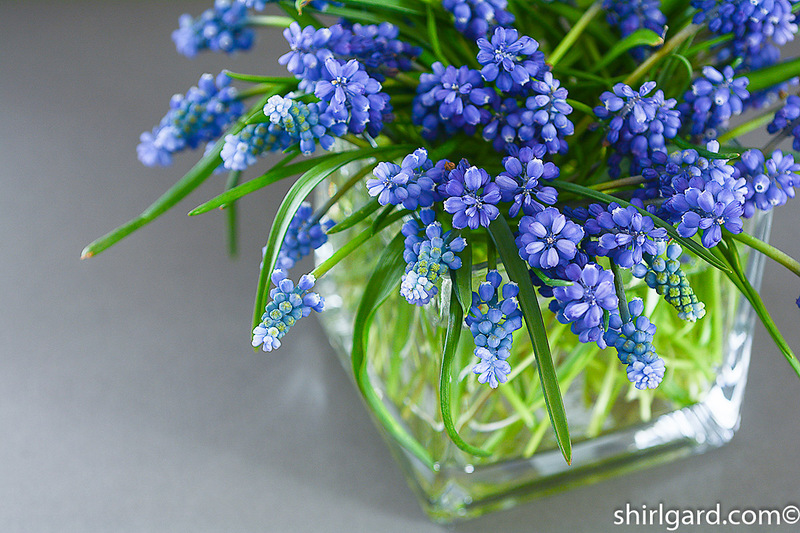 Sometimes, inspiration would come in the middle of the night when I would wake up with a brainstorm of an idea for a dessert; I would get up and write it down, always on large “post-its” or 4” x 6” index cards that I kept in the drawer beside my bed. 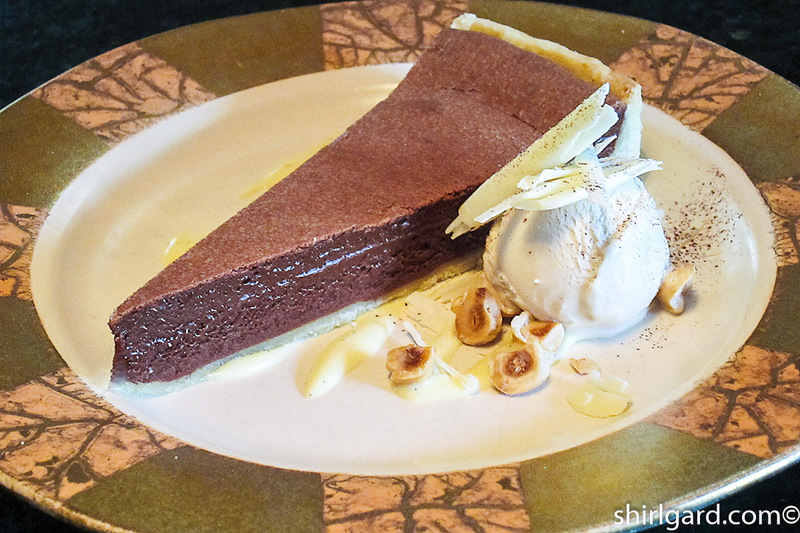 Somehow, because the dessert that appeared to be so clear in the middle of the night−and that I knew would have vanished into the ether by morning−compelled me to write it all down. When the alarm went off and I looked at my night table in the morning, there would be a pile of middle-of-the-night scribbling, including a list of components and sketches (I always did a lot of sketching) of how to assemble the dessert or how to plate it. This method of inspiration came to fruition many times. But I also found that you just have to grab inspiration wherever you find it, like from what I call my “upstairs bedroom ritual”. When I needed to write a menu, I would sometimes disappear into my upstairs spare bedroom and start leafing through my collection of cookbooks, rummaging through my file cabinets filled with manila folders of past desserts (maybe I could re-cycle something), and maybe dip into a file cabinet in the back closet filled with old magazine clippings, all organized by category (they told us to do this in cooking school, so I did.) Any number of times, I’ve gone into that closet and randomly reached into a file and pulled out a winner of an idea for a dessert. In 2011, when the chef, Peter Platt, asked for a Mother’s Day Menu, and needing to reach into the well of inspiration, I was in the middle of this “upstairs bedroom ritual” and by happenstance, started browsing through a cookbook called The Cake Book, by Tish Boyle (2006). 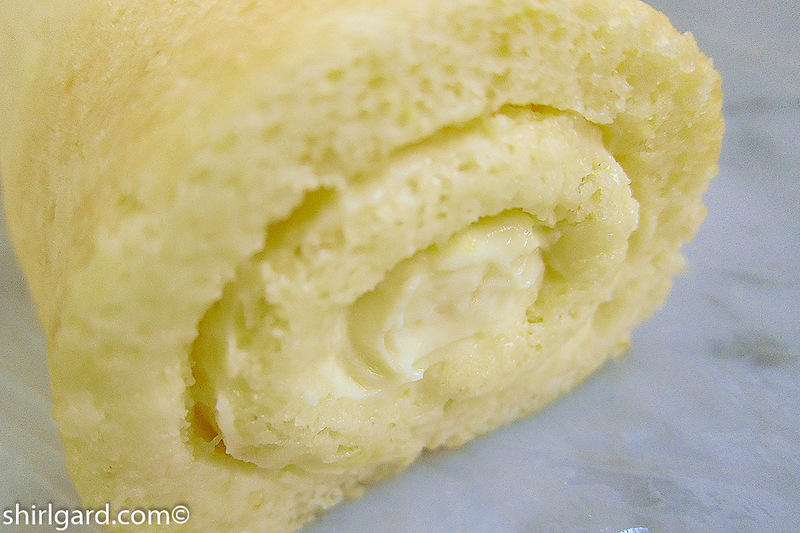 I stopped on the page titled “The Ultimate Lemon Roll”. Alas, there was no photograph, so my mind began to imagine what I could do with this concept and turn it into a plated dessert. 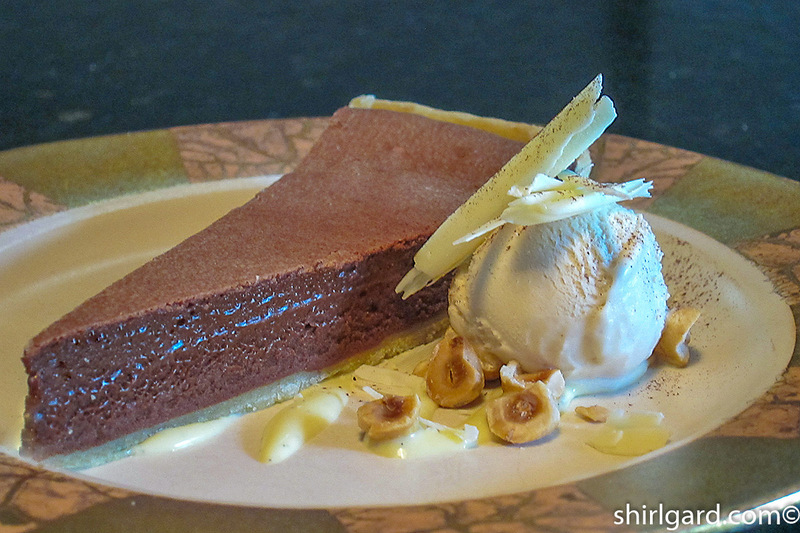 The photograph below is what I came up with, along with the other two desserts on that 2011 Mother’s Day Dessert Menu. Another source of information on writing menus that I reached for many times is a paperback called The Making of a Pastry Chef by Andrew MacLauchlan (1999). The section on “Ingredient Flavor Combinations” is my favorite. The author says that “These are not rules, but rather reference guidelines for conceptualizing the flavors in a dessert”. Under “Lemon”, a prominent compatible flavor is “Berries”. 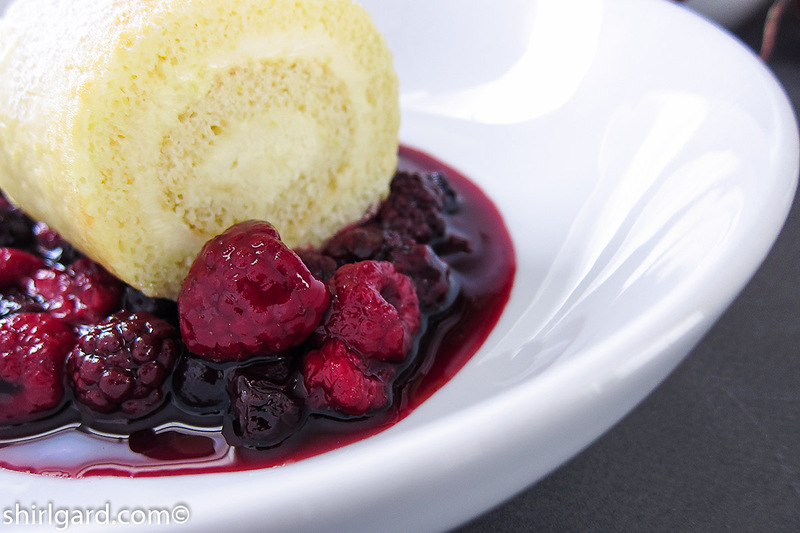 For my menu in 2011, I chose to pair Blackberry Gelato and Blackberry Compote with the Lemon Roulade. 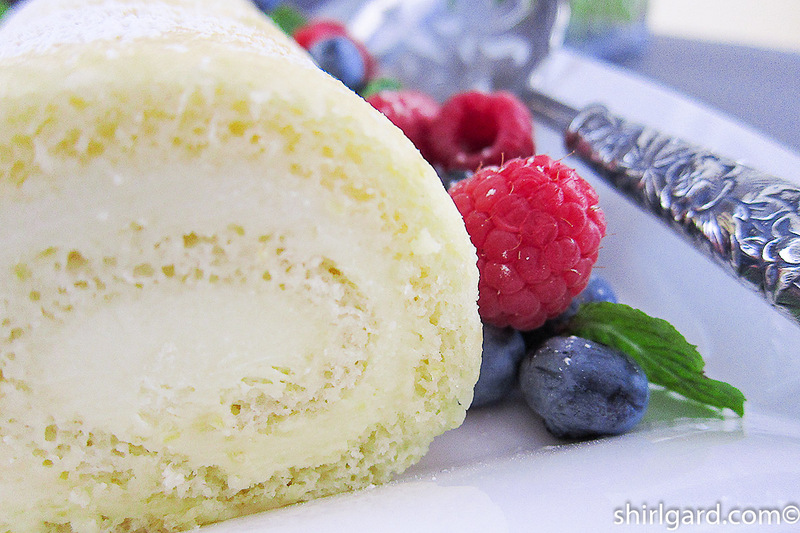 For this post, I made a home-y version of Lemon Chiffon Roulade. 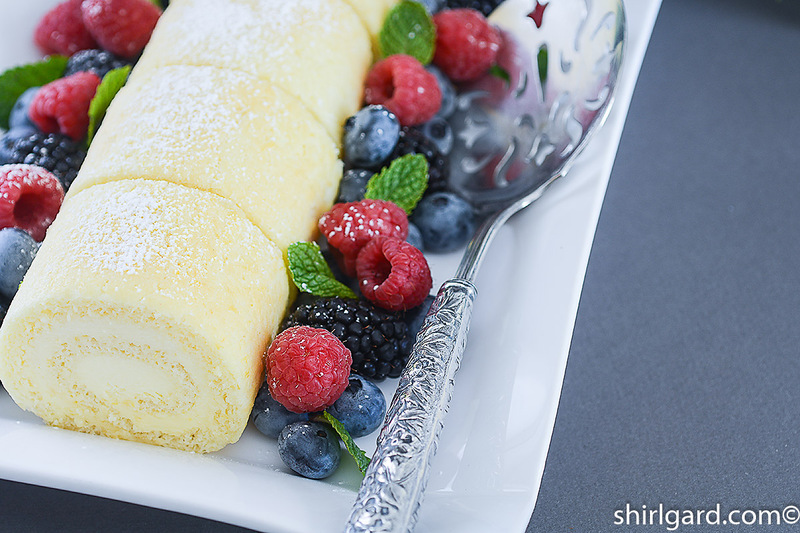 Made with a filling of Lemon Mascarpone Mousse and served with a mix of berries, it makes a great combination for Mother’s Day, but also for anytime. I hope you will try the recipes. I like to garnish with fresh berries and mint leaves, then serve with Berry Compote Express, (translation: quick) a barely-cooked combination of raspberries, blackberries, and blueberries, on the side. 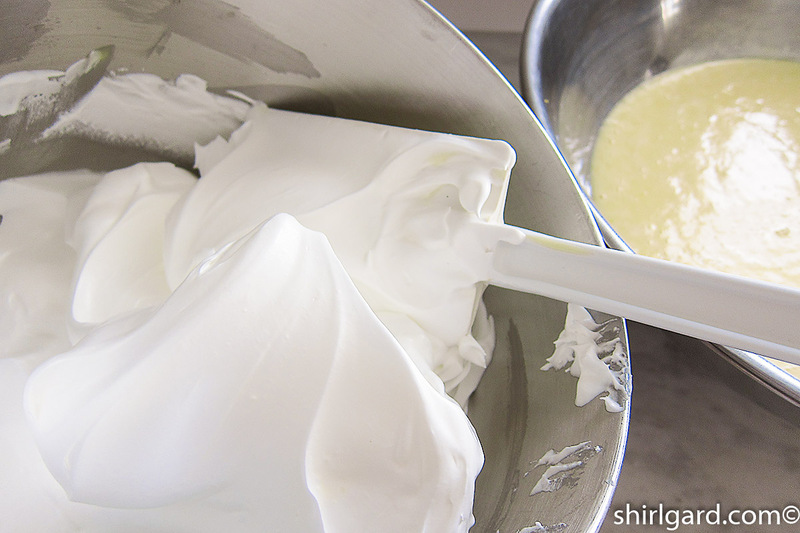 The meringue should be very smooth and glossy. 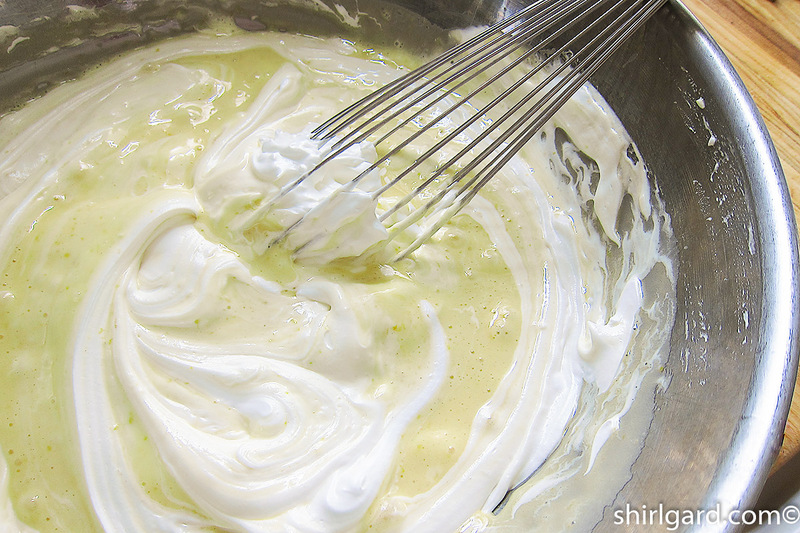 Fold 1/3 of the meringue into the egg yolk batter with a whisk. Add balance of meringue and fold in gently with a rubber spatula. Almost finished folding in the meringue. 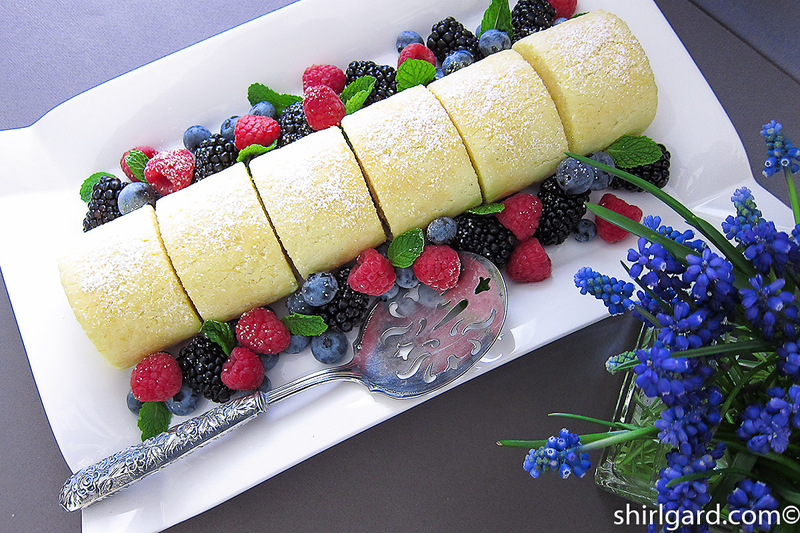 Baked Lemon Chiffon Sheet Cake. Trimming off 1/4″ of the crusty edges will make it easier to roll. Lemon Mascarpone Mousse for the filling. Placing spoonfuls of the mousse over the cake makes it easier to spread. Wrap the roulades in plastic wrap and twist the ends like a sausage before freezing. To slice the roulades, cut through the plastic wrap, using a serrated bread knife dipped in hot water. All cut and ready to serve. Remove plastic wrap at this point. Place on platter and dust with powdered sugar. 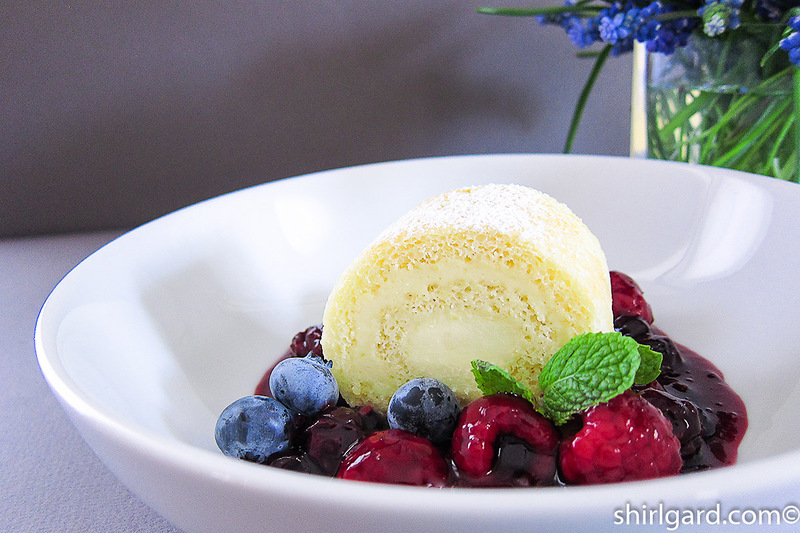 Garnish with fresh berries and mint leaves. 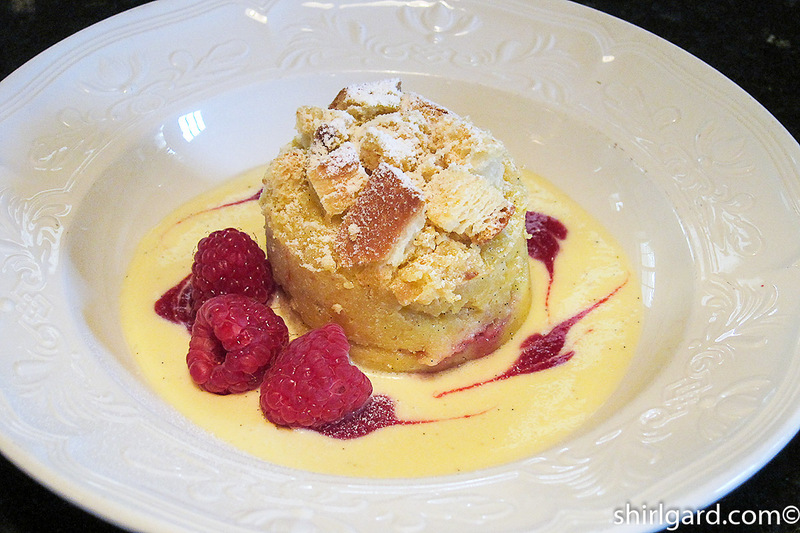 You can make this dessert anytime, but it seems I always think about it when Mother's Day (or Easter Sunday), or some other special event in Spring rolls around. This dessert goes together quickly if you make a plan and prep the components in the proper order, starting with the mousse. It is possible to do everything in one day if you start early enough to allow the mousse to cool and set up, but what I like to do is make the components over several days. 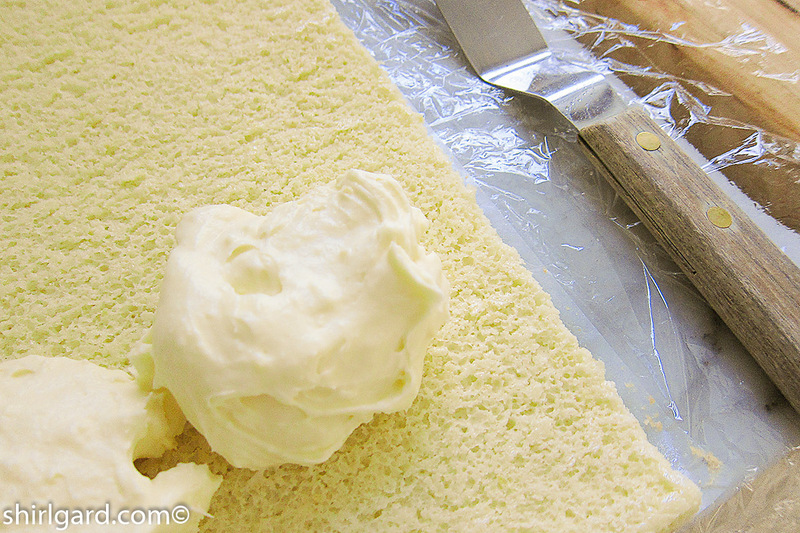 If doing it this way, make the Lemon Mascarpone Mousse for the filling the first day and refrigerate. 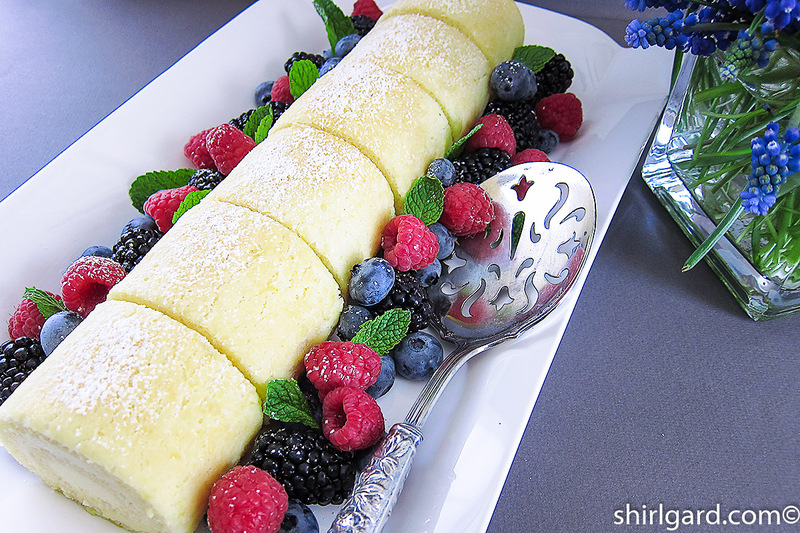 Bake the Lemon Chiffon Sheet Cake the next day and roll up with the chilled filling. Wrap in plastic wrap and twist the ends like a sausage. 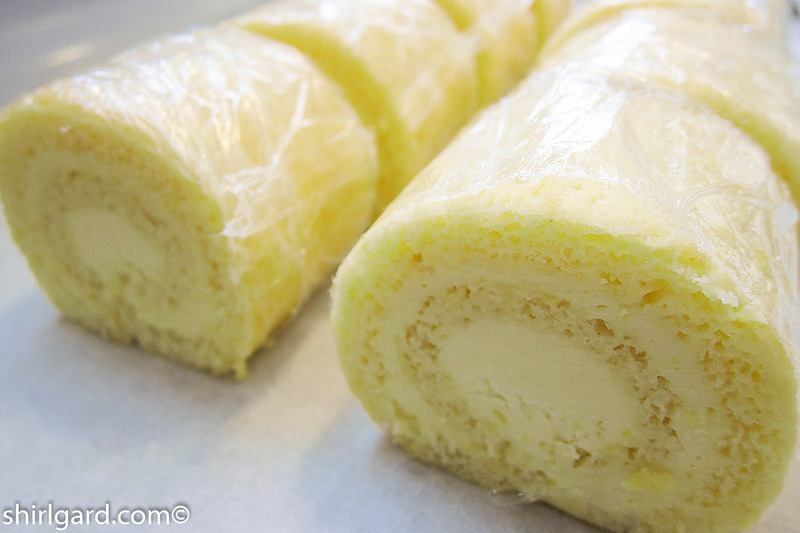 Since the plastic-wrapped rolls will need to freeze overnight before serving, plan to serve on the third day. Or, they can be frozen for several weeks at this point, ready to slice and serve when you need them. 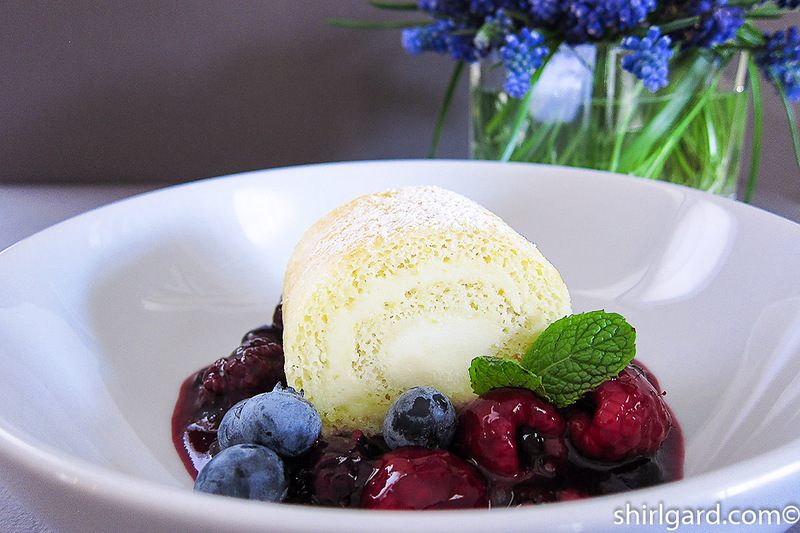 I especially like to serve berries with this dessert. My barely-cooked Berry Compote Express (meaning that it is quick to make) is a perfect accompaniment, as are fresh berries. MAKE FILLING: Lemon Mascarpone Mousse. Make ahead and refrigerate; the filling must be cold to assemble the roulades. PLACE yolks and 30g of whites in bowl of stand mixer (Kitchen Aid). Using the whisk, beat on high speed for 3 minutes until starting to thicken, Turn the speed down to medium and gradually add the sugar, a little at a time, over a period of 2 minutes. Continue whipping, back on high speed, until very thick and pale, another 2 minutes. TURN speed down to medium and pour in the canola oil in a slow steady stream with the mixer running. 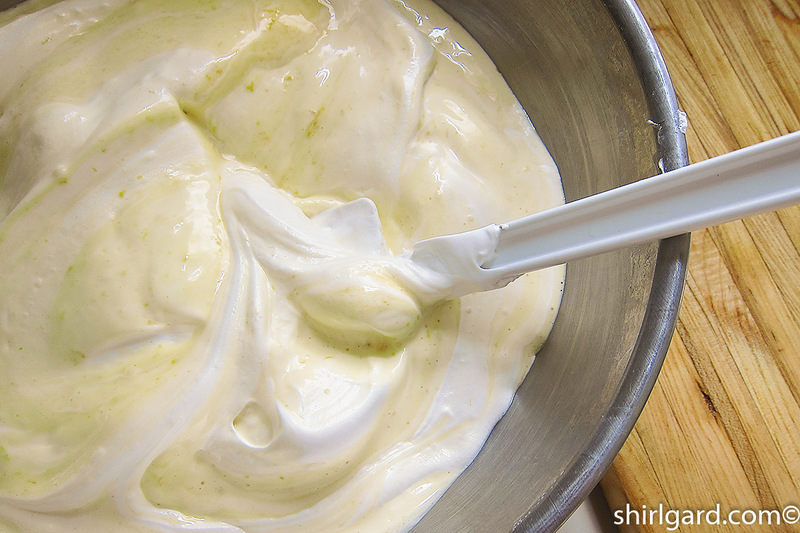 Add the lemon zest and vanilla extract and whip 1 minute longer. Turn off the mixer and scrape down sides. ADD the dry ingredients (on lowest speed) alternately with the liquids, dividing the flour into 3 parts and the liquid into 2 parts, starting and ending with the flour. 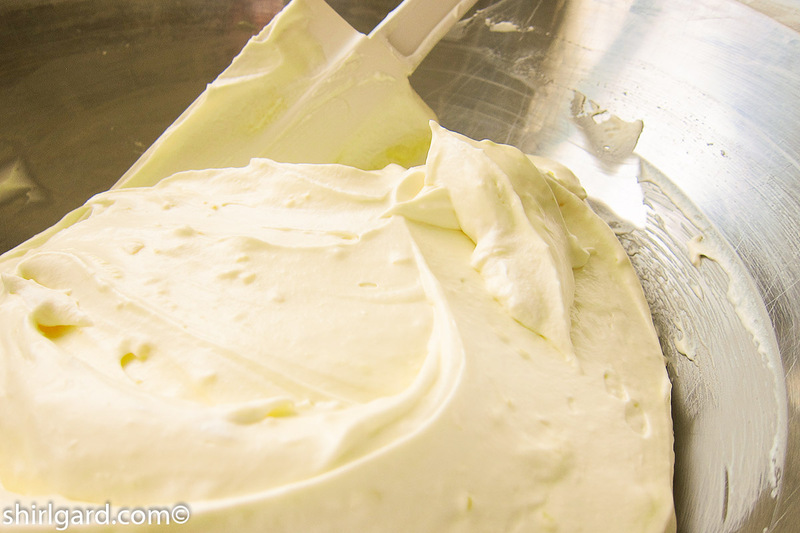 MAKE THE MERINGUE: Whip the whites on medium speed until frothy, about 2 minutes. Add cream of tartar and continue whipping until soft peaks form, about 3 minutes. Gradually add the sugar over a period of about 5 minutes with the mixer still running on medium speed, and whip to stiff glossy peaks. 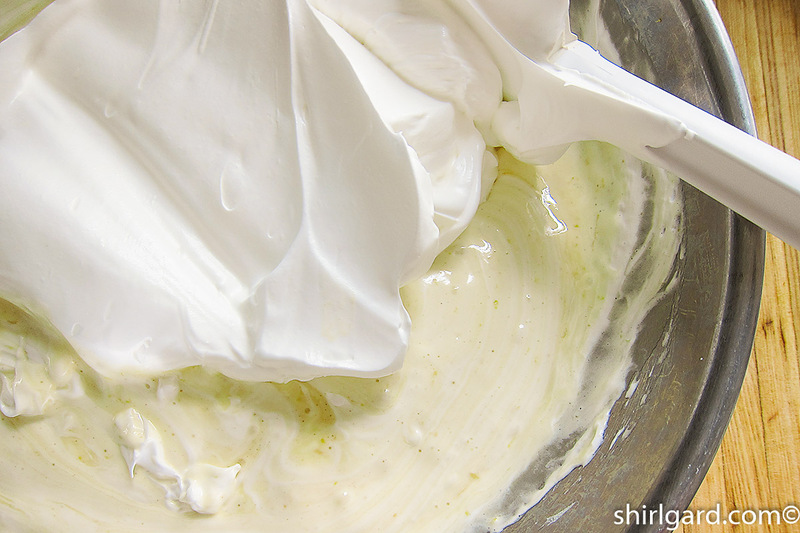 The meringue should be very white and smooth, and stand straight up when tested by dipping your finger into it. When the meringue is almost finished whipping, I like to do 30 seconds more at high speed. Watch closely; do not over-whip. If over-whipped, it will look rough, not smooth. SCALE the batter into two portions: 500g each. Press the parchment paper into the half-sheet pans and spray the paper with Pam (with flour). This assures that the cake will not stick to the paper; you want it to release cleanly. I do this even if my paper is silicone treated. 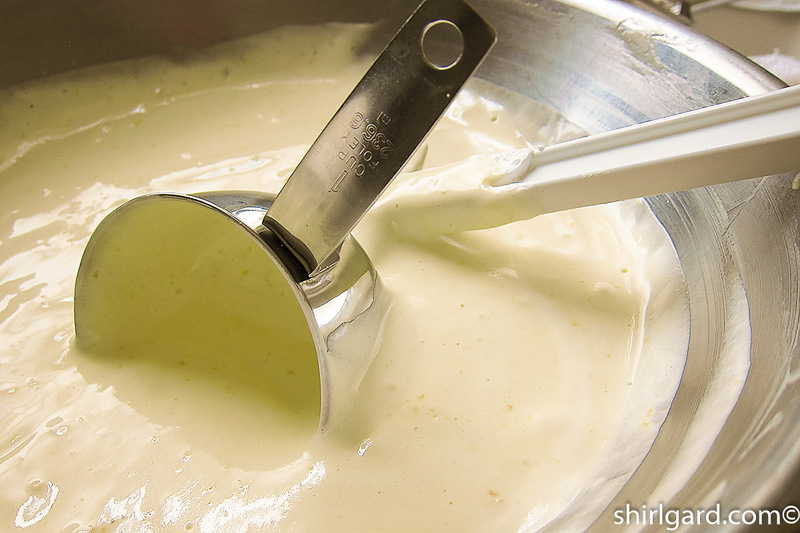 Spread the batter to an even thickness in each pan, making sure that it goes into the corners. Don't allow the batter to be thicker in the center of the pan. BAKE @ 350° F ( 175° C) for 18 - 20 minutes, until the cake is a light golden brown and springs back when touched lightly in the center. Also, it should just be starting to pull away from the sides of the pan. COOL cakes briefly (about 5 minutes) in the pans when sheet cakes come out of oven. This allows them to set up a little, as they will be very tender. Run a paring knife around the sides of the pan to loosen the cake. 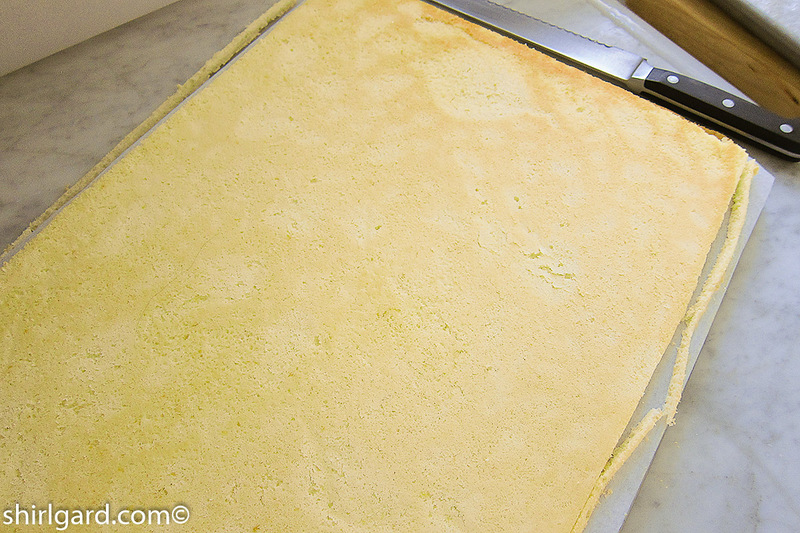 TRAIN EACH SHEET CAKE TO ROLL: Very important to do this step when the cake is warm. 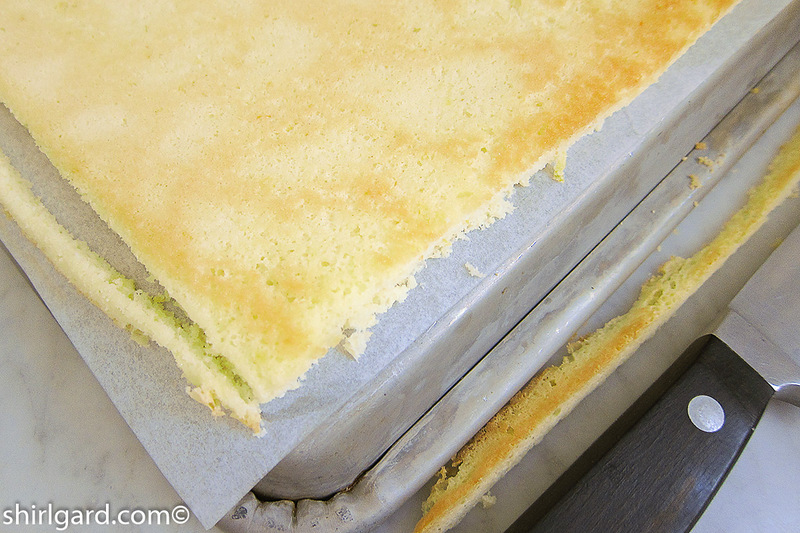 Once the sheet cakes cool, they don't roll as easily and tend to break when you try to roll them. 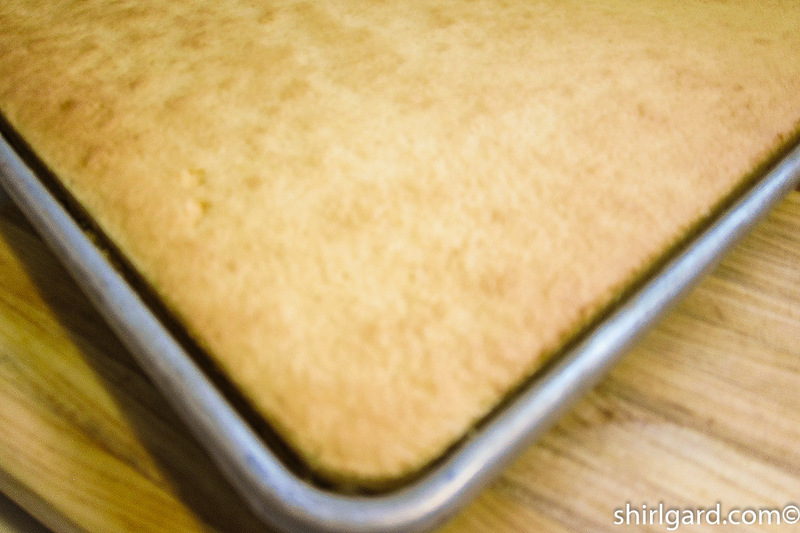 For each pan, place a sheet of parchment, sprayed with Pam, on top of the cake. Invert onto the back side of a second sheet pan. Cover with parchment and again invert onto the back side of a sheet pan. The top of the cake will now be facing up. Slide onto a cutting board with the long side parallel to the edge of the counter. Carefully trim ¼" off the crusty edges of the cake. Spray a length of plastic wrap with Pam and lay on top of cake. 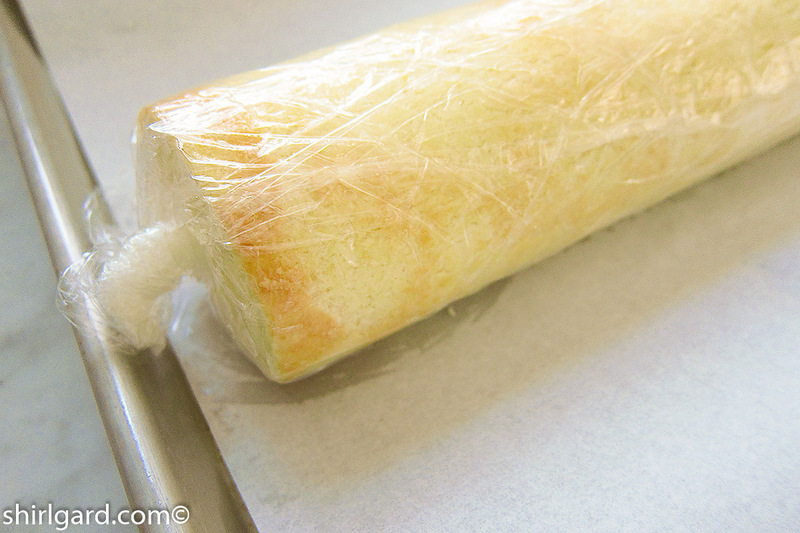 Starting from the long side, roll up the cake, now sandwiched between the parchment and plastic wrap. This is called "Training" the cake to roll. Place each roll on a sheet pan as you go. Let the rolls cool at room temperature before filling. 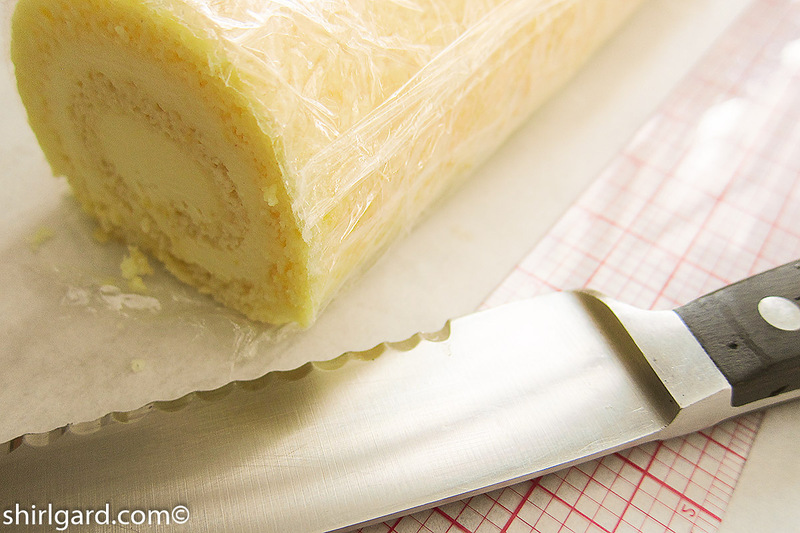 TO ASSEMBLE ROULADES: SCALE THE LEMON MASCARPONE MOUSSE @ 400g PER ROLL: Pull out a long piece of plastic wrap across the length of a cutting board. Gently unroll each cake on the plastic with the long side facing you. Remove the plastic that it was rolled with and discard. Spread the chilled filling over the surface of the cake, spreading it to within ½" of the top edge. Re-roll the cake, using the parchment to help roll the cake, but remove the parchment when finished rolling. Cover the cake roll with the plastic and twist the ends like a sausage, being careful not to crush the ends. Place rolls on sheet pan seam-side down. Freeze overnight. 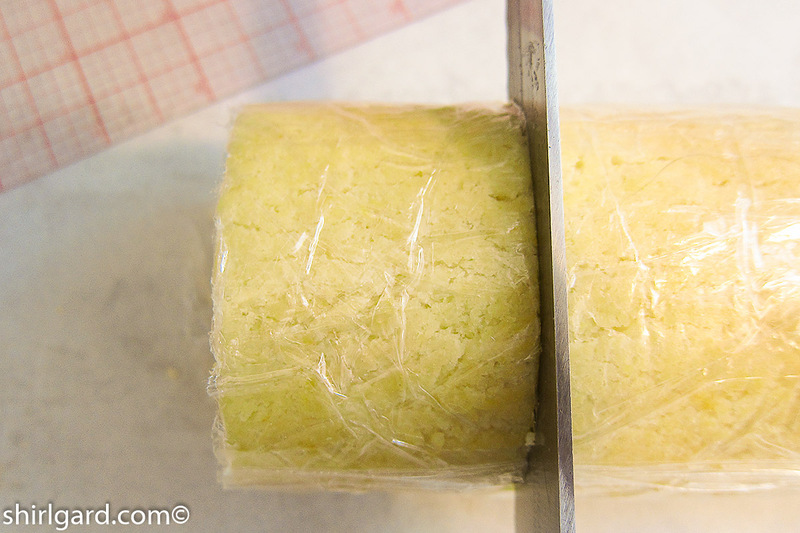 TO CUT ROULADES: Cut in 1¾" slices with a hot serrated knife, slicing through the plastic. Dip the knife in hot water and wipe clean after each slice. 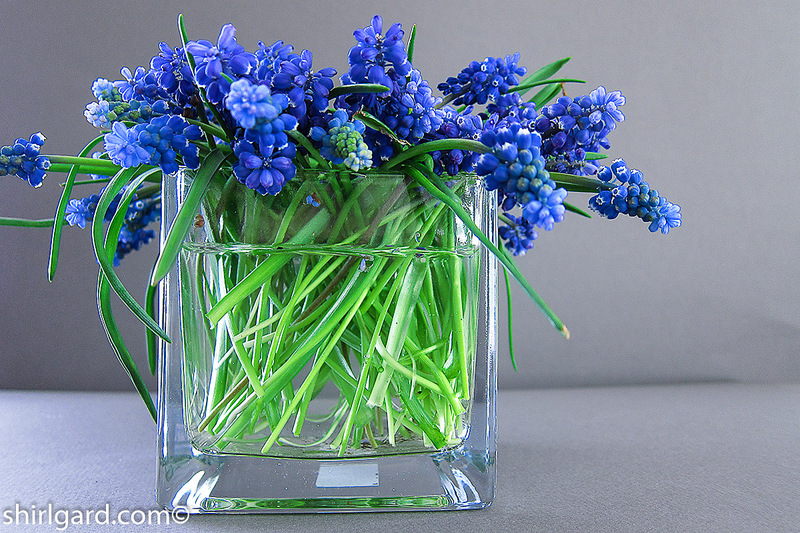 TO SERVE: Remove plastic wrap when ready to serve. Thaw in the refrigerator a few hours, then serve chilled, standing up on plate or platter. 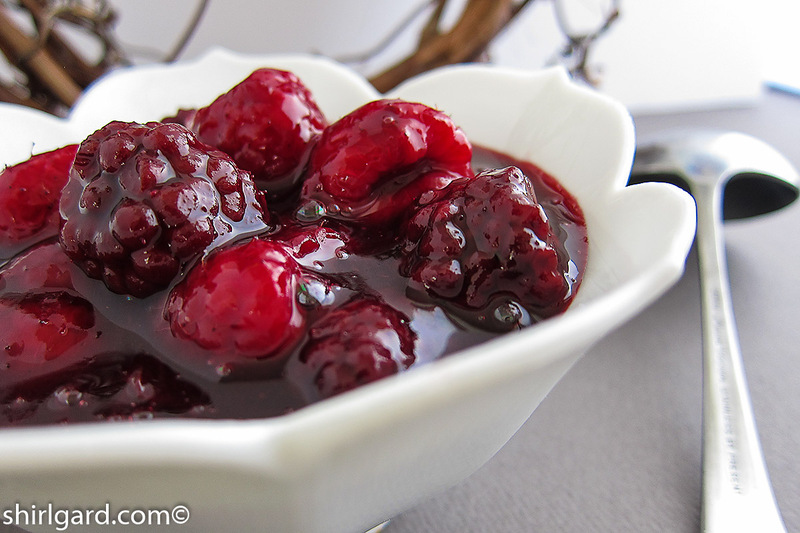 Garnish with fresh berries and serve with Berry Compote Express, if desired. 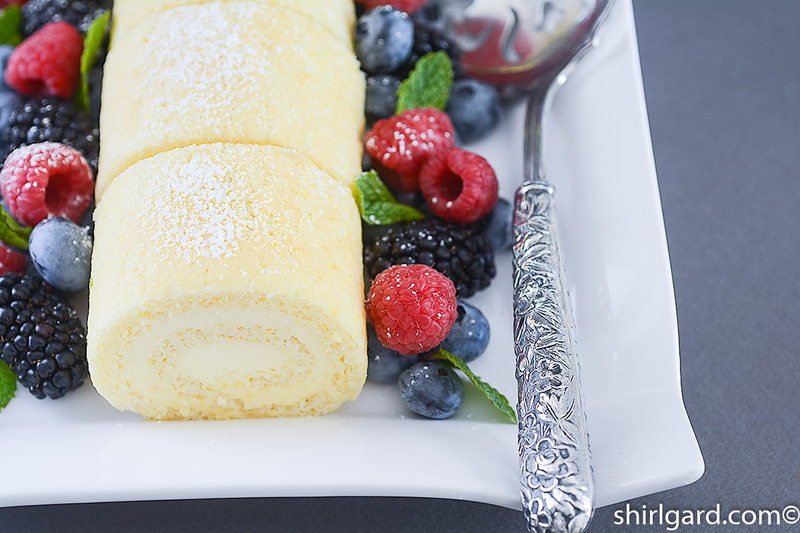 The concept for this dessert was inspired by a recipe called "The Ultimate Lemon Roll" in The Cake Book by Tish Boyle (2006). 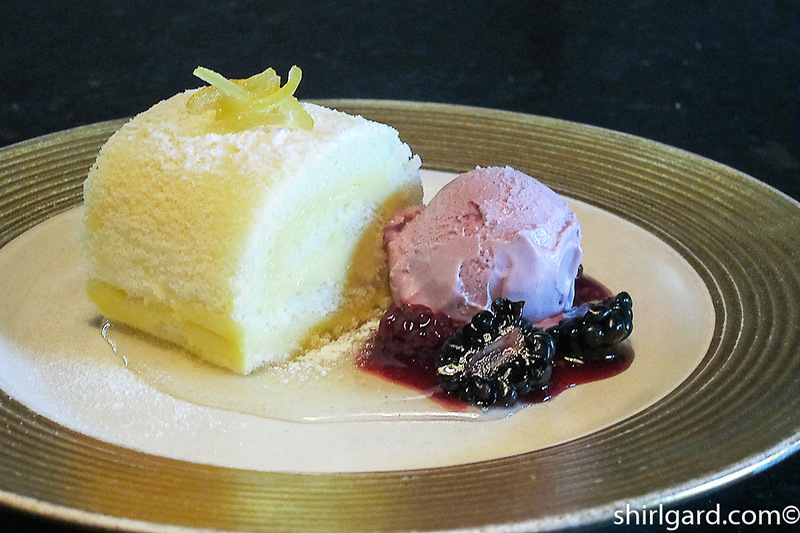 The Lemon Chiffon Sheet Cake is adapted from her recipe. The other recipes are mine. Your blog is absolutely beautiful !! Thank you so much Anna. As it turns out, I just looked at your site. I love your photographs.